Comments: Strap leaved evergreen tree native to New Zealand. 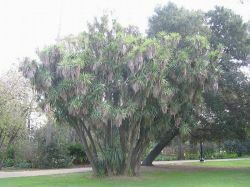 This low growing tree is related to Dracaena or dragon tree of Europe, and is similar in appearance to the North American Yucca. When the tree tops out (15 to 20 feet), it begins to sprout secondary trunks from its base. An attractive dry weather plant that does very well in our climate. This is one of the original species planted in Golden Gate Park in San Francisco.